Something has been bugging us for a while and we can’t get this out of our heads. We’ve headed here to our blog to get it out of our system. The truth is that the reusable bags you find at your local shopping centre are replacing a bad idea with a bad solution! Like the arguable majority of Australians we thought it was fantastic to see plastic bags phased out of shopping centres and to see the community at large consider and learn about their impact as consumers. Yet – have plastic bags been phased out? The vast majority of so-called ‘green’ bags are 100% polypropelene – nothing more than plastic! It also didn’t take us long to discover that these polypropylene bags stink. There have been studies about them containing lead or being bacteria harboured (erk!). Then there are the very popular polyester fabric versions. The case for a better solution seems fairly strong. 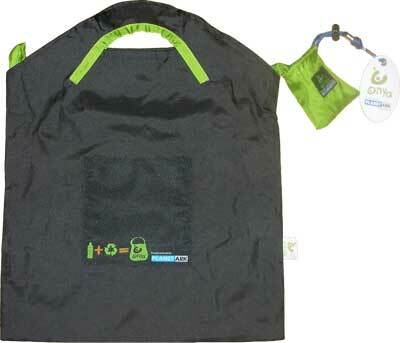 We for one family have been very happy campers since the purchase of our BANG consortium eco reusable shopping bag. By choosing a natural fibre we can be more sure that in the long term we are not adding to landfill. We are not only loving our BANG bags because of the eco qualities either; it’s just so nice to fill a bag up and not be in the least bit concerned about it breaking, ripping or having the bottom fall out of it. Compact is one thing that the BANG bag is not. 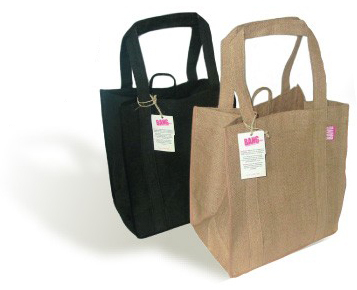 We understand that a lot of what draws people to the ‘compact’ options for reusable bags is the portability – the fact that many of these bag-in-a-bag solutions sit in your handbag permanently to be whipped out whenever necessary. We just can’t help but continue to feel unsettled about the fact that we could doing a lot better, that there are more appropriate solutions and alternatives. We realise that the concept and enthusiasm for replacing plastic bags has been a step forward – but why not step into the next century and adopt a genuine solution. If you really for whatever reason can’t do a biodegradable reusable bag like the BANG, why not lean toward rPET solutions like those offered by our friends at Onya? You might well see these hit our store in the very near future. As usual we are certainly less than perfect and are so embarrassed when we hit the checkout to realise that we haven’t bought bags with us that Pippa often feels some need to announce to the checkout assistant and all that stand behind us that we will do our best to establish some routine or system of reminder that ensures such a thing doesn’t happen again. Often met by looks of confusion[?] from those who hadn’t brought bags in the first place. We’re looking for some great ideas to help us remember our bags and if you see us in the supermarket without them do introduce yourself and then chastise us, it might help a little ;). We will ask this question on our Facebook page so look out there for some answers. Another fabulous option is certainly to make your own fashionable bag; [preferably from up cycled fabric of course] and if you want and have time to do so here is a handy reusable bag pattern link and equally great how-to video. If you do make your own, please take a little time to post a link to your creations here, or even your own favourite pattern link – might also motivate others to get sewing! The buzzword or the bare facts?